There are hedges and there are fences. When the twain meets, it’s a living fence, like this one spied on Laird Drive at Commercial Road last spring. A closer look showed the material used as willow wands. 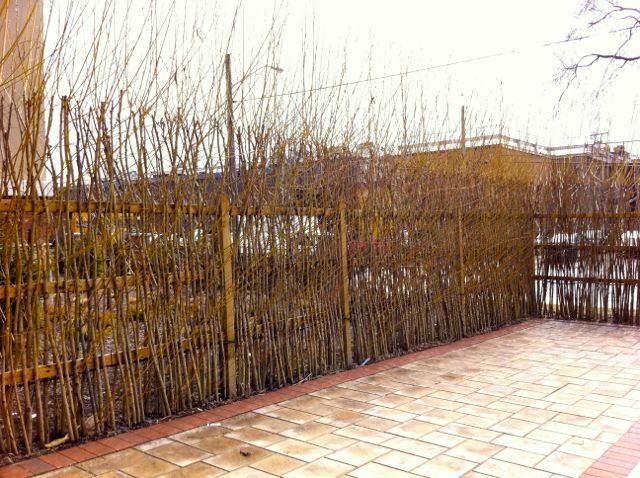 Straight, flexible and determined to grow – anywhere – willow is the ideal material for a project like this. 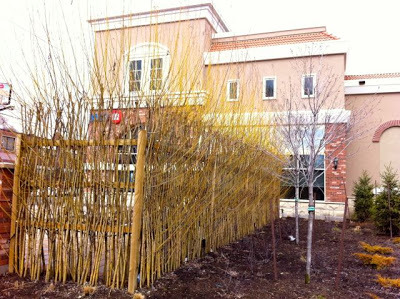 The fence secludes a bank entrance from some noisy transport traffic on Commercial – superior noise mitigation is one advantage of a living fence, according to the supplier’s website. Another benefit, important for urban users: no graffiti. Unless you count the brushstroke pattern of willow leaves as living graffiti, too. That I could live with, easily. Some sleuthing uncovered this supplier to be The Living Wall (after trying to reach them, I finally confirmed the source by spotting this project on their Facebook page). Here are a few details. 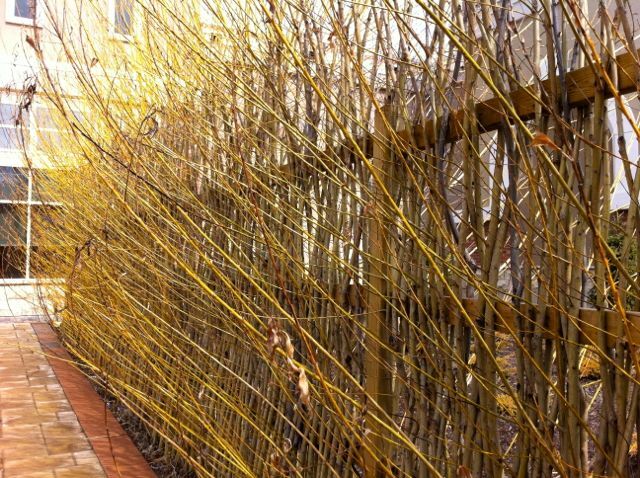 This living fence is a woven basketwork of willow wands between wooden frames. This isn’t the only type of living willow fence by any means. 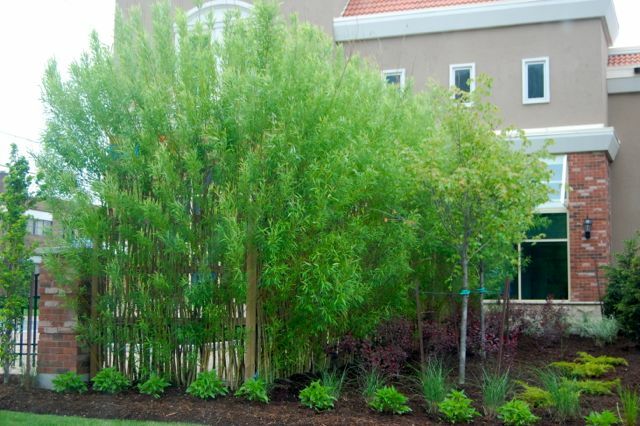 The other day, when researching Patrinia, I noticed that Bluestem Nursery sells willow rods, and even gives you their own recipe for weaving living willow structures. It might be a fun project for an ambitious gardener. 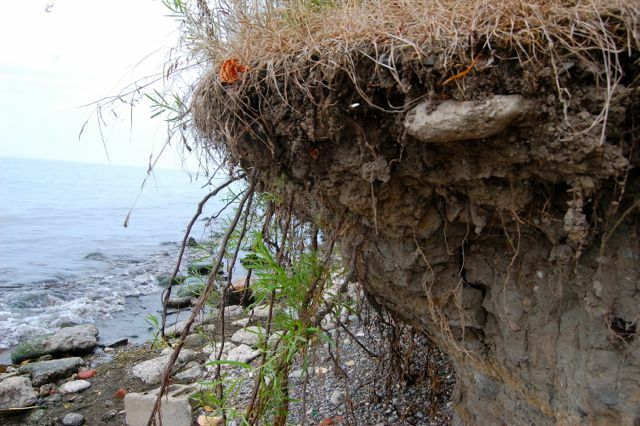 Just to show you how determined willow can be, take a look at these offshoots coming off the exposed roots of willows by Lake Ontario in Tommy Thompson Park. Where there’s a willow, there’s a way. This is just what I have been looking for, Helen, thanks for sharing it! I really like the idea of the living fence, have the willow, recently coppiced to give us the long and straight whips to with which to weave it at Semi's house. Love that you are coming to Asheville next year! Fedge is a good name for it, Diana. Anything that roots easily might do. I've heard that hazel has also been used historically for this type of woven hedging. 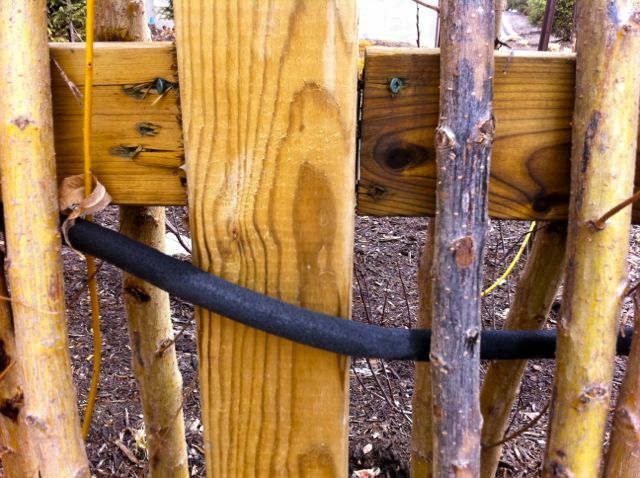 Awesome, I make non living willow fences and this has applications that I think would work well in certain places. Seems like they would need to be trimmed often. And then what about when they grow into trees? Hi, David, Most hedges (eg. privet) have to be trimmed often and some (eg. Siberian elm) will grow into trees — huge trees — if left untended. 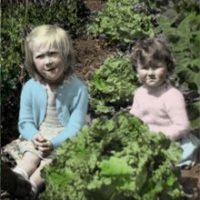 We wrote about escaped hedges a while back. I'll likely do an update on this hedge this summer, so stay tuned. Wow, what a transformation when the fence is in leaf! Whenever I've been near this hedge over the summer, I've either been in a hurry to get somewhere or couldn't find a place to stop. But it really has filled in over the years.